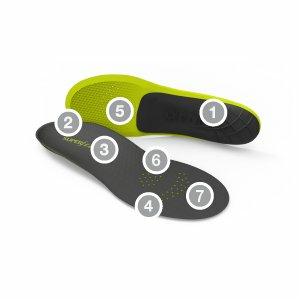 Superfeet CARBON Insoles breakthrough design combines the strength of EVOLyte™Superfeet’s proprietary carbon fiber & polymer blend with ultralight high-density foam to create the most innovative, high performance footbed ever for runners. My knees have been saved! Originally I was a runner who was experiencing knee tiredness, pain even at some point (when my shoes were starting to wear down especially). 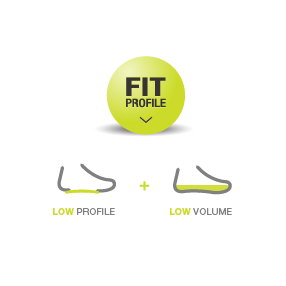 I was fitted for new shoes and in that store they explained that as we get older our arch actually flatens out demanding more of other areas like our knees to pickup the slack. By placing these inserts inside my running/now tennis - court shoes I have no pain or even feel the insert. I just am back to doing what I like (seriously, everyday), running the courts. I wouldn't even consider wearing my court shoes/athletic shoes without my inserts and you can move them from shoe to shoe as needed and they last about 1 year if use them as frequently as I do. I'm a 51, 5' 4", 135. Using those inserts 4 -5 days a week for 1 to 3 hours. I recommend these for certain. This store I found on Amazon and they have a good price point for this amazing quality product and excellent fast shipping service.